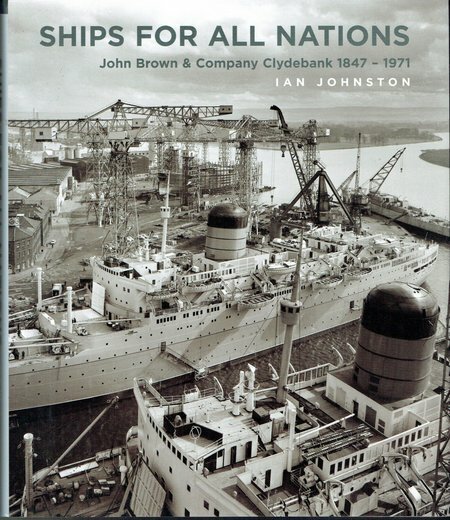 The author is from a shipbuilding family and has written a number of fine books on ships and shipbuilding on the Clyde. This new book is lavishly illustrated in large format and have been carefully produced by the publisher. This is a very important story that has been told well, highly recommended. DESCRIPTION: The author is from a shipbuilding family and has written a number of fine books on ships and shipbuilding on the Clyde. This new book is lavishly illustrated in large format and have been carefully produced by the publisher.This is a very important story that has been told well, highly recommended. Clydebank led the world in the building of steam powered steel ships. There was a large British merchant fleet to equip and a large Royal Navy, but the shipyards also supplied the world. These yards dominated the market as part of the dominant British shipbuilding industry but it was to eventually decline and collapse. There have been many theories as to why such a powerful industry was to be almost completely destroyed. Inevitably, any dominant force will become the focus for all competition and, if it fails to meet the current environment, it will be defeated. However, there are always stages where contraction can be halted and reversed to create a new period of growth and dominance. Certainly, the shipbuilding industry contained the seeds of its own destruction. Theft by the workforce was endemic and some have claimed that for each new ship the material to build three vessels was procured. That may have been an over-estimate, but theft was a significant factor. As the yard passed the cost on to the customer, that made the ships expensive and as customers learned to bargain hard, the shipyard margins reduced and made them vulnerable to any drop in the order rate. Industrial action, or more accurately inaction, meant that delivery times frequently slipped and this discouraged future customers. Decline cannot be placed on workers or managers without recognizing the part played by politics and particularly by the policy of managed decline that was a major part of every Government from 1945. The Labour Government of Atlee and Bevin squandered the money poured into Europe from the US to rebuild the war-shattered communities. Rationing was continued after it had been abandoned in Germany and other European countries. There was a general failure to understand how heavy industry and world demand was changing and that meant a failure to mount policies to help British shipbuilding to change and grow again. So the first part of the history covered in this book is one of great achievement and leadership, followed by rapid decline and near destruction, but even in the twilight years after 1945, the Clydebank yards still had many great achievements that showed the spark of innovation and engineering excellent was still alive, awaiting a fresh breath to let it once more flare into the brightest flame. Clydebank built the great transatlantic liners, Lusitania, Queen Mary, and QE2, the QE2 being one of the welcome sparks in the later years, not only a great liner but a key element in the Task Force that sailed 8,000 to boot the Argentine invaders out of the Falklands and liberate the Falkland Islanders. Not only great commercial vessels, but also notable warships. The battlecruiser Hood may have been one of a group of warships with fatal vulnerabilities, but she was the RN flagship between WWI and WWII. Vanguard was the last battleship built for the RN and although she was armed with second hand guns, she was a fine sea boat and out-performed the US battleships in exercises, being able to continue on in conditions that hampered the USS vessels. Perhaps the finest product from John Brown was HMY Britannia. John Brown himself was closely involved in the design and construction of this world famous vessel. Through ingenuity, he oversaw the production of a vessel that looked bigger than it was, adapting a ferry design, to produce the first true blue water dedicated Royal Yacht for the British Sovereigns. This ship produced a huge surplus over its operating costs in bringing business to Great Britain and only venial politicians cut short its valuable service to Great Britain and the British economy. In some respects it was a victim of the same policy of managed decline that was to affect the yard that built her. This is a book that has to be read. It is fascinating and insightful, but it also demonstrates what was possible and how it could be so casually thrown away.